Last Friday 22nd of June took place the 3rd session of Informative talks of our Student Chapter. 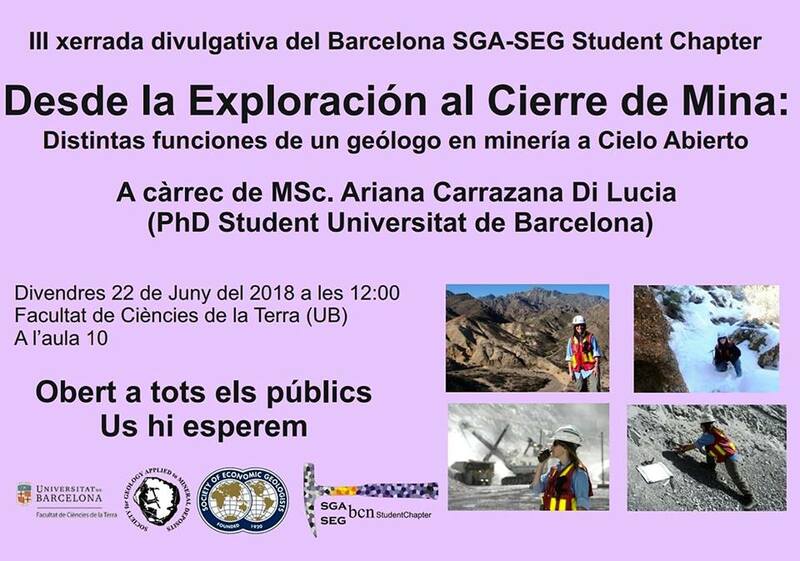 In this occasion, one of our members, PhD student Ariana Carrazana, gave the talk with the title “Desde la exploración al cierre de mina: distintas funciones de un geólogo de mineria a cielo abierto” (From exploration to the mine closure: the different functions of an open pit mine geologist), in which she talked about her former work as an exploration geologists in a mining company in Argentina. The talk covered all the possible jobs a geologist is expected to perform in a mining company, and how they have a major effect in the good development of the mining operations. Her experience was a good example for many students that want to initiate their carriers in mining exploration, and encouraged them to do so. The session ended with some questions and discussions between the audience and the speaker. We would like to thank Ariana for her instructive talk that allowed us to finish the Informative Talks of this academic year very successfully.